Fitzwilliam Darcy is a traitor. He even admits to collaborating with Napoleon’s troops. And Elizabeth Bennet despises all traitors. But Elizabeth can’t make sense of Darcy. He doesn’t act like a traitor. He risks his own safety to save young women from the French. And how can she despise a man who loves puppies? Something about him doesn’t add up – and she finds him far too attractive. Then Darcy’s carefully constructed world crumbles, and he must entrust his closest-held secret to Elizabeth. To protect that secret, Elizabeth must disappear entirely, leaving her family and Darcy behind, to plunge herself into the dizzying world of fashionable London and the dangers of the Loyalist Resistance. Nothing will ever be the same again. Darcy is determined to find Elizabeth. Now that she knows the truth about him, there’s nothing to keep them apart – nothing, that is, until the day Darcy is forced to choose between his country and the life of the woman he loves…. Mr. Darcy is at his wits’ end. Elizabeth Bennet, the woman he can’t live without, overhears him insulting her family. Now she won’t even listen to his apologies. Then his old friend Sir Anthony Duxbury tells him two of their friends are in terrible danger. If Darcy wants to help them, they have to leave for Yorkshire immediately. But something doesn’t add up. Elizabeth claims to know Sir Anthony, too – but by a different name. What game is his old friend playing? And is it dangerous? Even Sir Anthony says the trip is dangerous. The Luddite rebels are on the verge of armed revolt – and he should know, because he’s one of them. Darcy’s cousin Lady Frederica decides she’s going with them anyway, and insists on bringing Elizabeth. Could this be Darcy’s chance to earn Elizabeth’s forgiveness and her love? Elizabeth would rather face a squad of Napoleon’s soldiers than spend three days trapped in a carriage with Darcy and his headstrong cousin, but she has her own reason for agreeing to come. If she can just manage to keep her temper, she may be able to rescue her uncle from financial ruin. But when a Luddite riot erupts around them, it’s Darcy and Elizabeth who need rescuing – from each other. August 2005. The greatest natural disaster in American history is fast approaching New Orleans. The lives of Elizabeth and William, Marianne and Chris, and Emma and George are turned upside down. Friend, family, stranger, and foe alike will meet their fates as a killer named Katrina tries to drown the Gulf Coast. From a storm ravaged Gulfport to the miserable Superdome and a desperate Tulane Medical Center, the reader is shown a fuller picture of a story they thought they knew. While First Responders work against time to save the trapped, NOPD captain Richard Fitzwilliam’s quest to apprehend drug-dealer Greg “G-Daddy” Wickham comes to a shocking end. The survivors must pick up the pieces of their shattered lives. Will bureaucratic bumbling by government officials prove too much for the kindness of strangers to overcome? Will those left in the Crescent City ever find normalcy again? 2004. Emma has married George, but the workaholic surgeon is neglecting his young wife. When she meets the smooth-talking Frank Church, her marriage is endangered. Marianne finds love with Chris and begins a singing career, but a figure out of her past is doing everything in his power to crush her dreams. Elizabeth is successful in business but not in love, and her job puts her face-to-face with William for the first time in five years; the man she almost destroyed, and who still owns her heart. Meanwhile, NOPD captain Richard Fitzwilliam continues his crusade to bring down the one felon that has eluded him: the drug dealing murderer Greg “G-Daddy” Wickham, now more dangerous than ever. 1998. Elizabeth Boudreaux is a daughter of the owner of a small oilfield service company in Chackbay, a small hamlet in the swaps of Louisiana. She is studying journalism at Loyola University in New Orleans. Her roommate is vocal music major Marianne Dashwood, whose divorced mother lives in Jackson, Mississippi. Mari’s friend is Tulane fine arts student Emma Weinberg, who lives in the Uptown neighborhood with her widowed father. They will meet the men who love them and the men who will break their hearts. Elizabeth is both attracted to and repelled by overconfident graduate student William Darcy, heir to a vast shipping fortune. Marianne is caught in a triangle between the charming John Waguespack and the quiet Chris Breaux. Emma is so busy running other people’s lives she overlooks her life-long friend, Dr. George Katz. Chuck Bingley, from Baton Rouge, is bedeviled by his needy sister, Carrie, and harassed by his dominating mother, Catherine. Meanwhile, Darcy’s cousin, NOPD Lt. Richard Fitzwilliam is searching the city for his nemesis, drug dealer Greg “G-Daddy” Wickham. All these lives, and many more, will collide in a year of love and friendship, trials and tribulations, tragedy and murder. One of the great “what-ifs” among Pride & Prejudice aficionados is: if Mr. Collins married Mary Bennet instead of Charlotte Lucas, how would that influence Mr. Darcy’s dogged pursuit of the elusive Elizabeth? In this breezy and hilarious re-telling of Jane Austin’s classic novel, the author explores what would have changed — and what would have not — had two of literature’s most self-righteous characters found their way together. Jane goes with Elizabeth to Kent, and the fur flies! A wonderful, mad-cap romp! Join us on a romantic adventure like no other in this whimsical Pride and Prejudice-inspired tribute, featuring Wickham, Georgiana, dirigibles and swash-buckling pirates. In this humorous re-imagining of Jane Austen’s Pride & Prejudice, Elizabeth Bennet’s pet cat causes an unfortunate accident to befall the haughty Mr. Darcy, forcing the injured gentleman to reluctantly take up residence at Longbourn — more specifically, in the parlor of Longbourn! In pain, forbidden to leave by his doctors, Mr. Darcy cannot escape the ridiculous antics of the Bennet clan. And when Georgiana Darcy, Colonel Fitzwilliam, and Lady Catherine de Bourgh arrive to visit the invalid, chaos, confusion and hilarity ensue! Inspired by the classics of comedy, author Jack Caldwell transforms Austen’s beloved novel into a tour de force of farce. The Regency will never be the same! Elizabeth Bennet’s pet cat causes an unfortunate accident to befall the haughty Mr. Darcy, forcing the injured gentleman to reluctantly take up residence at Longbourn — more specifically, in the parlor of Longbourn! In pain, forbidden to leave by his doctors, Mr. Darcy cannot escape the ridiculous antics of the Bennet clan. And when Georgiana Darcy, Colonel Fitzwilliam, and Lady Catherine de Bourgh arrive to visit the invalid, chaos, confusion and hilarity ensue! There’s only one fact that notorious rake Lord Charles Carlisle and his cousin, Fitzwilliam Darcy, can agree upon: a house party given by the Marquess of Bentham is bound to be intolerably dull. To relieve his boredom, Lord Charles accepts a bet that he can seduce his sister’s pretty friend during their stay at Bentham Park. 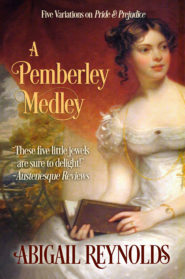 But when Darcy discovers that Lord Charles’ new target is none other than Elizabeth Bennet, the woman who refused Darcy’s offer of marriage, he cannot stand by and watch as the woman he still loves is callously ruined. What he doesn’t know is that Lord Charles has a dark secret, and that his attentions to Elizabeth may not be what they seem. It’s the best of all worlds in this collection of five short Pride & Prejudice variations. Can Mr. Darcy win Elizabeth Bennet’s heart… or are they doomed to misunderstand one another forever? Can Mr. Darcy stand by and watch while Elizabeth loses everything she holds precious… including him? A lady’s reputation is a fragile thing. If anyone discovered Miss Elizabeth Bennet had received a letter from a single gentleman, she could be ruined… or forced to marry a man she detests. In this Pride & Prejudice variation, Elizabeth takes the safe course and refuses to read Mr. Darcy’s letter of explanation. Returning home unaware of Wickham’s true nature, Elizabeth confesses everything to him, putting both Mr. Darcy and herself in grave danger from Wickham’s schemes. In Jane Austen’s classic Pride & Prejudice, Elizabeth Bennet never expects to see Mr. Darcy again after his disastrous proposal in Hunsford. But what if family business required him to stay at Rosings after giving her his letter? Coming face to face with Mr. Darcy only days later could give Elizabeth a new chance to understand him… or a chance for even more misunderstandings. It is a proverbial dark and stormy night when Mr. Darcy proposes to Elizabeth Bennet in the most insulting manner. Just as she begins her famous refusal, a crack of thunder presages the pounding at the door as the residents of the flooded village of Hunsford seek refuge from the storm at the parsonage atop the hill. Even worse, the flood has washed out the only bridge leading to Rosings Park, leaving Darcy stranded with Elizabeth at the parsonage. The river isn’t the only thing that overflows in Hunsford when Darcy and Elizabeth are forced to work together to deal with the crisis under the worst possible circumstances. And it may already be too late to redeem Elizabeth’s reputation…. In this Pride & Prejudice variation, the lane dividing the Hunsford parsonage from Rosings Park has been replaced by one of the flood-prone Kentish rivers. The storms are real – the spring of 1811 was remarkable for numerous thunderstorms in Southeast England. A lady’s reputation is a fragile thing. If anyone ever discovered that Miss Elizabeth Bennet had received a letter from a single gentleman, she could be ruined… or forced to marry a man she detests. In this Pride & Prejudice variation, Elizabeth takes the safe course and refuses to read Mr. Darcy’s letter of explanation. Returning home unaware of Wickham’s true nature, Elizabeth confesses everything to him, putting both Mr. Darcy and herself in grave danger from Wickham’s schemes.